How To: I started with the lightest shade in the palette – a shimmery ivory – and swept from lash ling to brow bone. I used the pure gold shadow over the lids and the dark brown shade in my crease. I used the center shade, a speckled bone glitter, on my brow bone to highlight. For lips, I chose an orange/ red (very “holiday party” spirit) and dabbed a bit on the apples of my cheeks to add color. 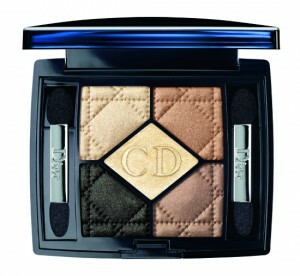 Did You Know: For a smoky look, you can use the dark shade in the crease and under the lower lash line. Make sure to sweep out. *Unless otherwise noted, face makeup is: Giorgio Armani Luminous Silk Foundation in #6; RMS Beauty “Un”Cover-Up in #22. Brows are Anastasia Tinted Brow Gel in Espresso. Mascara is Lancome Definicils High Definition Mascara in Deep Black.